Over at Big Questions Online, astronomer Nidhal Guessoum asks Why Should Scientists Care About Religion? “The reverse exercise, to try to convince scientists and other educated people that religion should be taken seriously, is much more difficult, for several reasons. First, there is an intrinsic asymmetry in the relationship: science, in addition to being a methodology and a discovery process, is able to ascertain a vast array of results and present whole swaths of established knowledge. Today, no one can doubt that matter is made of atoms and particles, that life evolved and produced a vast tree of species, or that the universe has expanded from a singularity and is today made up of hundreds of billions of galaxies, each made up of hundreds of billions of stars, many/most of which have planets around them, etc. 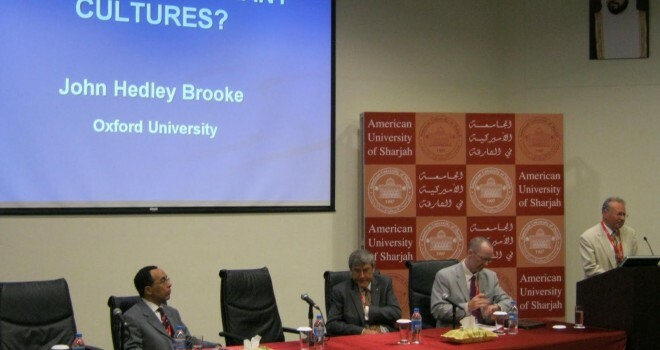 Guessoum is a professor at the American University of Sharjah, in the United Arab Emirates. While his argument that science and religion are not fundamentally irreconcilable may not sway many scientists on this side of the Atlantic, he does raise some interesting questions. “Should “Religion” and “Science” just be considered as totally separate “magisteria” (as in Stephen Jay Gould’s ‘NOMA’, the Non-Overlapping Magisteria) or should one attempt to relate the two in some way? To the extent that religion is defined by a set of practices, customs and rituals, I think the answer to the second question is almost certainly no. From an anthropological perspective, the religious impulse seems to have been hardwired from the beginning. As for Gould’s NOMA, it was never a very compelling model for an accommodation between science and religion, either for scientists deeply skeptical about the value of religion’s influence in society, or for theologians skeptical of the notion that science has nothing to contribute to our understanding of moral and philosophical questions. *Author’s disclosure: The Templeton Foundation sponsors the Big Questions blog, and formerly sponsored a religion and science journalism fellowship, of which I was a beneficiary in 2010.